As promised, I have a new recipe to share with you--just in time for summer! I've always been something of a smoothie nut--at least when I've had access to a good blender! I have fond memories of frequenting a smoothie place that opened up right near my house when I was in middle school. My sister and I fell in love with these smoothies, and we soon realized how easy it was to make our own delicious, refreshing drinks filled with all kinds of tasty stuff! Every summer we would pull out the blender in our kitchen and mix up all sorts of different concoctions. When the warm weather came around this year, I was thrilled to start experimenting with my new blender. I've been mixing things up pretty much daily for the last week or so, and when my boyfriend claimed this smoothie as his favorite, I figured it would be a good pick for a post. If using a high-powered blender, add ingredients in the order listed and secure the lid. 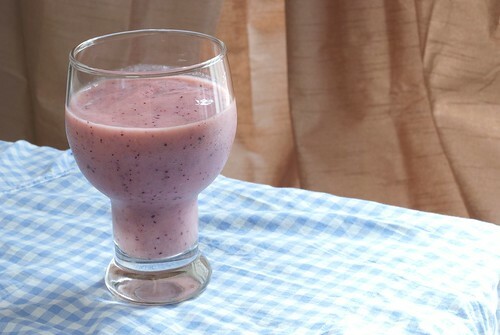 Start off at a slow speed, and quickly increase to the highest speed for your blender. Blend until smooth. *If using a less powerful blender, you will have to grate the carrots or omit them. You'll also need to add the ingredients in batches. Add about half of the strawberries and bananas in with the orange juice and yogurt and blend until smooth. Add in the remaining ingredients and continue to blend until desired consistency is reached. If you like your smoothies really thick, you can omit the milk altogether. If you'd like to thin it out a bit, add 1/4 to 1 cup milk and blend until desired thickness is reached. If you like (or would like to start) making smoothies in the summertime, stock up on your favorite fruits and yogurts. Alternatively, you can use silken tofu to thicken up your smoothies as well (I have some smoothie recipes utilizing this ingredient coming soon!). Bananas are a nutritious and inexpensive addition to any smoothie, and even if you're not a huge fan of their flavor, it is oftentimes masked by the other ingredients. You can even buy the day old bananas at the market to save even more--just be sure you get them into the freezer as soon as you can! Peel and freeze bananas in a plastic baggie or other container in your freezer. And no need to stop with frozen bananas--you can chop and freeze things like mangoes and other fruits as well. Fruit-filled smoothies also offer an opportunity to slip in other healthy ingredients, such as the carrots in this recipe. The carrots have a bit of a sweetness to them which meshes well with the other ingredients. Their taste was virtually imperceptible in this particular recipe. i just love bananas in my morning smoothies! Apples don't really contain soluble fibers, but don't let that stop you from putting it in your smoothie! Adding more fruits only makes it more nutritional, so have a blast and get creative with your smoothies.